The original of this prototype got sick 🙁 The one you can launch is the version I created for a live conference at the ATD Philadelphia Regional Conference. Since it was a live audience choice interactive session, you’ll see animal faces here and there (pig, cat, monkey, etc.) Those are not essentially part of the experience. I used them to poll the audience what answer they want to choose by imitating the four animals. (It was fun though). 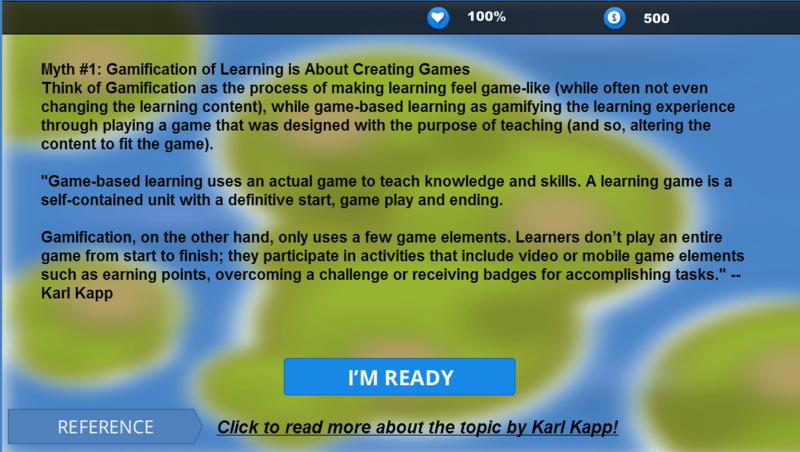 Expose 6 myths about gamification/game-based learning and provide some clarity around them. Introduce game-design elements used in gamification/game-based learning, not just by defining them but showing them in action. Engage in Amy Jo Kim’s Action Matrix (player types) to better understand our audience. 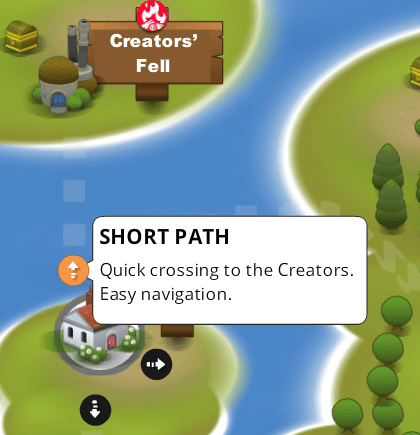 Instead of listing and defining all these elements, I decided to show them in action within a framework of a gamified solution in Storyline (without using my usual game engine). This is a work in progress, you will find lots of bugs, incomplete features and placeholders. It’s being tweaked. But! I thought it would be useful to see the WHY’s and HOW’s below as it progresses week by week. Consider this as a “Tweak Out Loud” work. Click the image to launch the demo. Before you read further about how it was made, I would suggest playing with it a little first! Remember, All Myths Must Die! 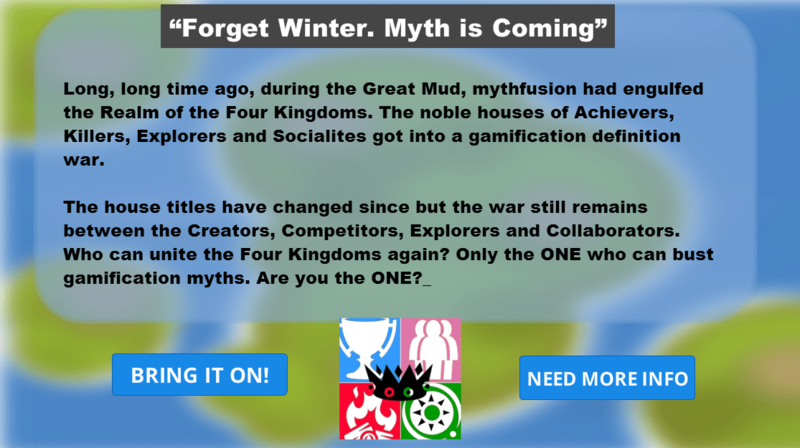 Welcome to Gamification of Thrones, a story about an ancient place, called the Four Kingdoms. Storytelling is a great technique that grabs the user’s attention. Even Angry Birds has a story. Sweet, short, to the point. Gives you a reason to hate the pigs from the beginning. This piece is about Gamification Myths and players. You will the play the role of the One. The One, who can unite the Four Kingdoms, torn apart by the gamification definition war. 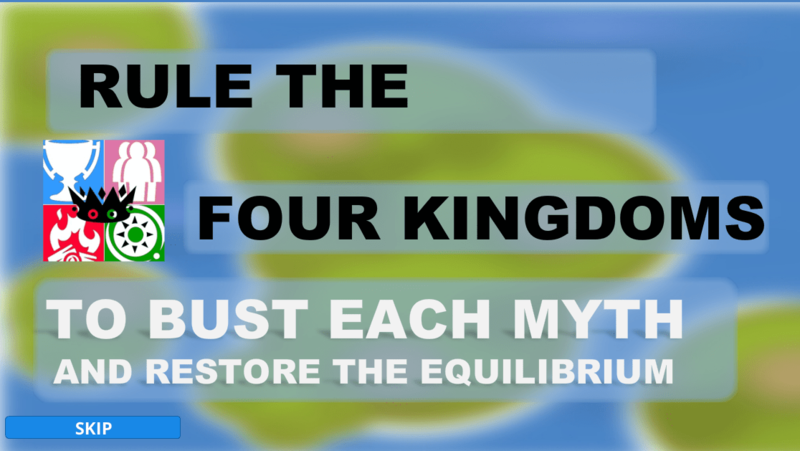 You’re going to have to travel in places to bust each Myth and restore the Four Kingdoms’ Equilibrium (whatever that is). The SKIP button. First timers will probably go through the intro. But consider those returning again. All they want is jump into action. The SKIP button gives them the power to do that. The Four Kingdoms are not just out of the air. The original, ancient ones are from Burtle’s player types. The new ones come from Amy Jo Kim’s social action matrix. (A more elaborate version is from Marczewski’s Player and User Types Hexad at http://www.gamified.uk/user-types/. I used Kim’s version merged with Marczewski’s. )While it’s not as simple as placing anyone in a black and white player type, thinking about players’ motivation and behavior patterns help us understand how learners/players may react to certain game-design elements (and why, for example, leaderboards are not for everyone’s top thing).The logo provides a visual anchor. You don’t know it yet but you’ve been just exposed to the icon/color representation of the four Kingdoms: Explorers, Creators, Competitors and Collaborators. The BRING IT ON and NEED MORE INFO provide a choice to accept the mission. Remember the Matrix? Red pill vs. blue pill choice? In movies, you’ll find this element around 10-15 minutes in. This is a the deliberate choice our hero must make. It’s the first “Yes” in sales. It’s a commitment. Some people don’t like to jump into action. That’s fine. They can peak around the NEED MORE INFO page that provides links to gain a deeper understanding of the gamification topics. a) Progression. As you bust each Myth, you will see your progress clearly marked here. b) Something that is 0%. It can’t be good. Hovering over each of the markers, they give you some clues. 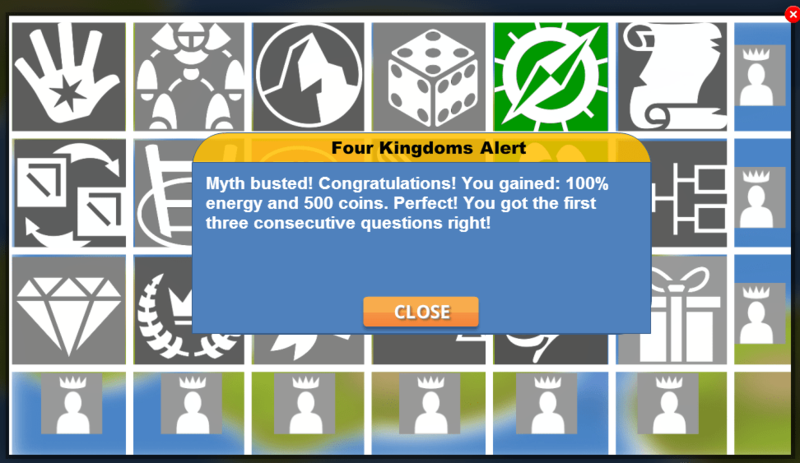 The 0% is the overall Gamification Equilibrium of the Four Kingdoms. You will have to bring it up to 100%. Not sure how yet. More to come on that later. c) 100% energy. Sounds healthy. Moving around will cost you energy. To replenish your lost energy, you will have to bust Myths. d) 500 coins. Things like transportation will cost you money as well. Even if you’re the One. a) and b) are visual indicators towards your goal. c) and d) are resources you will need to manage in order to achieve those goals. This setup suggests that you will have to make decisions and those decisions will have energy and monetary consequences. 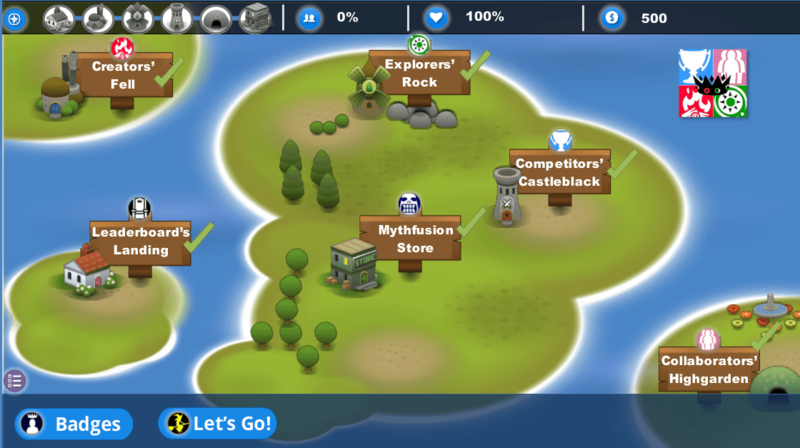 Having multiple resources (but not too many, remember, it’s not a real game. It’s a framework to build learning on.) 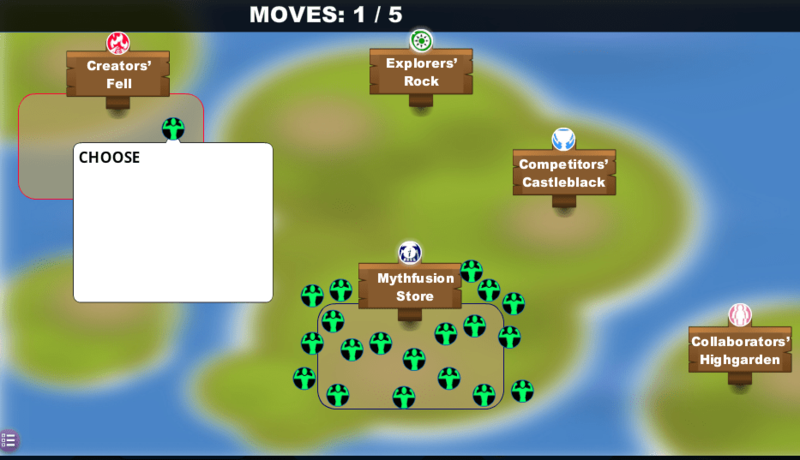 provides you choices to build a strategy, which makes the experience more game-like. In movies, it’s called exposition, when you need to know something and the character just tells you the information, like out of the blue. Or even worse, the character tells it to someone in the movie (who already knows or doesn’t even care) just to make sure you know it. Exposition is a sign of a bad movie. In learning, it’s like putting tons of textual information on the screen that you “need to know”. At that point, you’re already asleep or cognitively overloaded. Way to kill engagement. In this case, I had to tell you more about the action matrix and learner types, so you can make some decisions. There’s great information on this on Amy Jo Kim’s blog. However, in a game-like situation information must be chunked, actionable and engaging. The trick used here is personalization. As you click on each marker to learn about the Four Kingdoms, you will see information presented from a personalized perspective. In other words, each Kingdom tells you what “THEY THINK” of the others. The context provides you with flexibility to infuse emotion, tone and attitude as personalization elements to grab the learner’s attention. So you might have questions like: Is it really true what they say? Do I trust these people? What’s the hidden agenda? All of them say they should be on the Throne. The conflict is clear. There’s nothing more engaging that actions in a game-like environment. You’ll find no next buttons here. Did you notice the little “Hamburger” icon at the bottom of the screen? 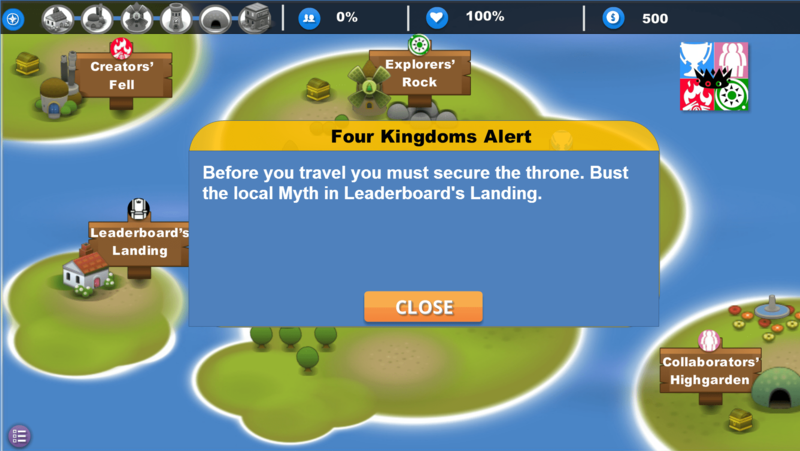 Once the learner visits all locations (check mark indicates) to learn more about the Kingdoms, the Action Board automatically pops up with the Hamburger icon. Since this is the first time you’re exposed to this world, it’s important to give guidance how to proceed. After that you’re on your own. The Action Board is a context-sensitive placeholder (actions depend on where you are on the map) for actions available for you. It slides in and out, not interfering with the map, unless you evoke it. 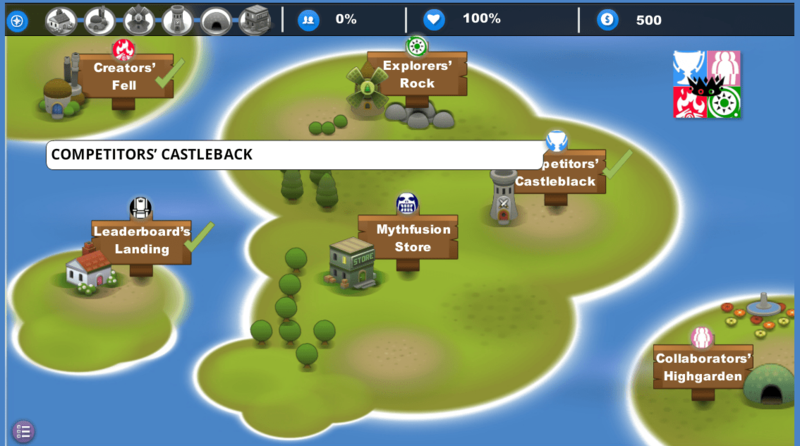 In this introductory phase, the user can choose between viewing the badge inventory or jump right into the game. The way you gain energy and coins is by busting Myths. 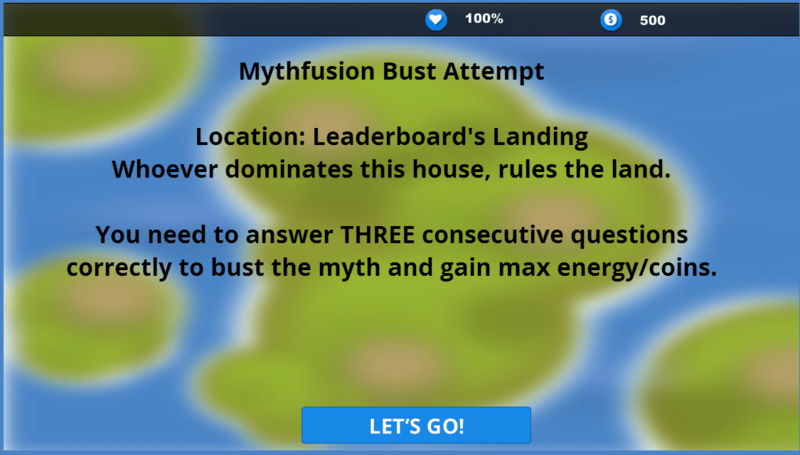 The Bust Myth button is located on the Action Board as we just saw. 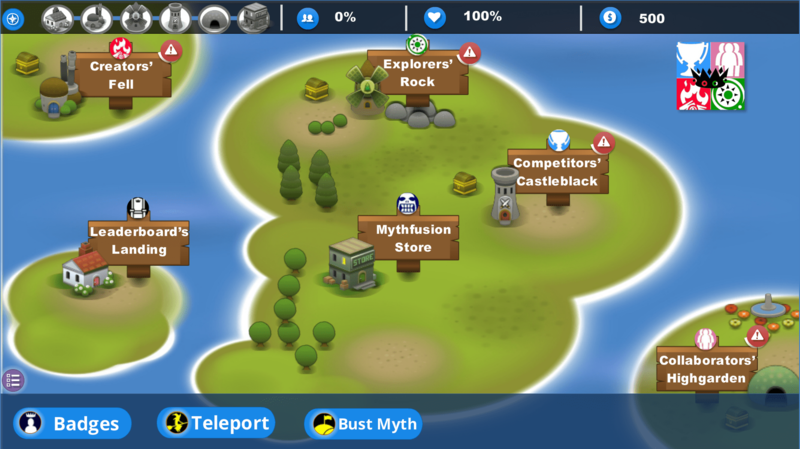 The button gives the Myth for the current location. Each location has its own Myth. Busting a Myth involves two steps. First, you read a brief summary of the Myth. Each Myth includes an external link reference from gurus to read more about the topic if you want. 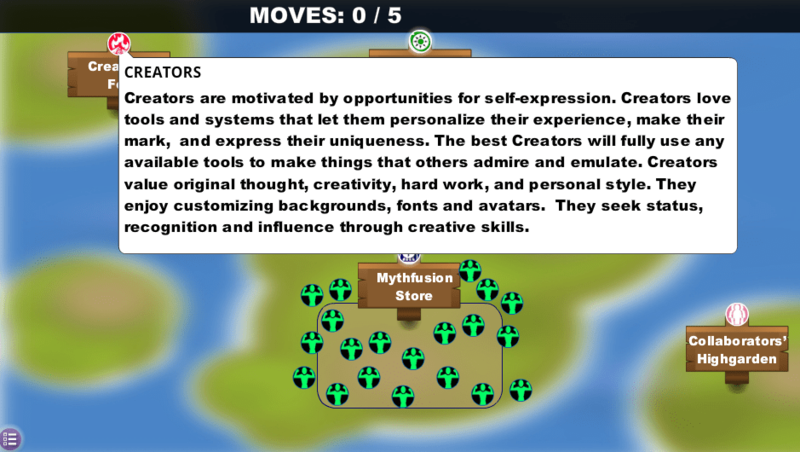 The second part has something to do with gamification elements and player types. 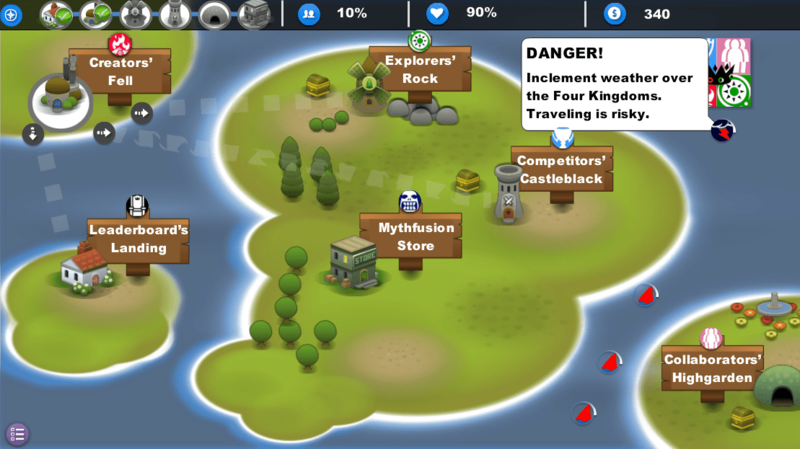 After a game-design element is introduced (in this example, Exploration), you need to decide which two houses you would implement this in the Four Kingdoms. 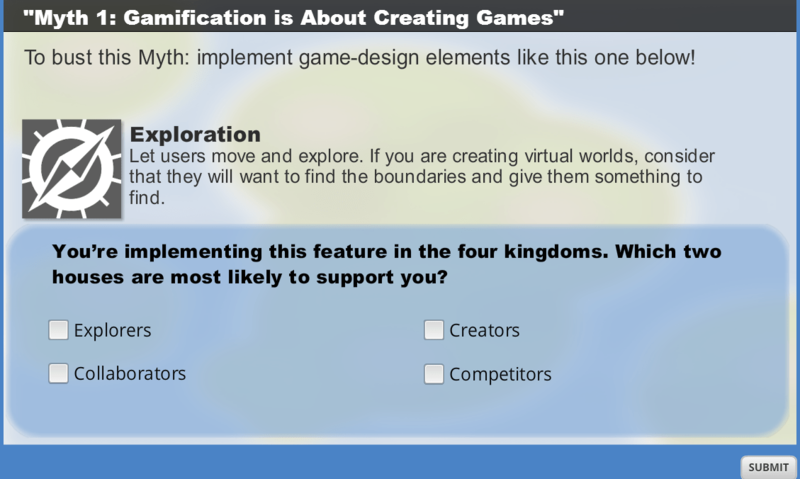 In other words, you need to match the gamification element and the most likely player types that support it. This is not so much of a clear-cut answer as only Competitors love challenges kind of thing. 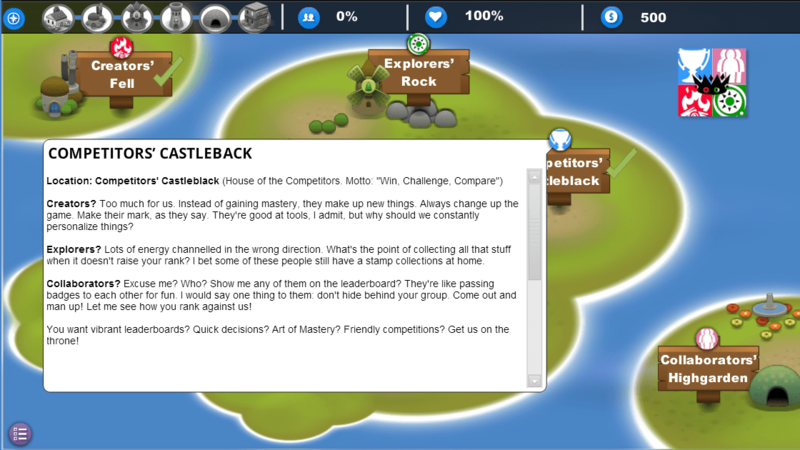 The purpose is to expose gamification elements and think about how players react. Question Bank! The game-design elements are coming from a question bank, randomized. In order to bust the Myth, you need to answer 3 consecutive questions correctly. If you incorrectly answer one question, the countdown starts from 3 again. Why? Player do not have to go through a fixed set of questions every time. Once they get better, they can get in and out of a Myth bust quickly. For each correctly answered question, you gain a gamification element as a badge. Badges! There are 18 badges altogether. The badge inventory shows those in color you have already achieved. Since badges are displayed randomly in the question bank, it is not guaranteed that you would get only those you do not have yet. This introduces some randomness in the system. Full colored columns and rows are rewarded. Moving around in the Four Kingdoms is easy: you select a route and a transportation vehicle. Strategize! Moving around starts with selecting one of the available routes from your current location. Some routes are safer than others. Some routes are costlier than others. Move around! Buy it, use it! Once the route is selected, you have a choice of available transportation methods (foot, horse, scooter, car, chopper and boat). By default, you can walk. Everything else you need to purchase first. Each transportation method has its own cost of energy and coin. The more sophisticated the transportation method (faster), the less energy it costs. You will need a boat first, since we’re on islands. Why transportation? The important part of the experience happens when you’re repeatedly exposed to gamification myths and gamification elements. That happens through busting Myths, for example. To bust all 6 Myths, you need to move around. When you move around, you lose energy and coins. In order to replenish that energy and coins, you need to bust Myth more (you may bust a Myth any number of times). Transportation forces you to do more Myth busting since you need energy and coins. While these are realistic transportation vehicles, in your design, you may use the concept the apply it to your framework. You could travel in the body for medical themes and use medical procedures or medicine as transportation device. The point is to provide some engagement offering different strategies but covertly guide the learner towards the actual learning. In Storyline, I used variables to keep track of what transportation vehicle you own. The page checks it for each item and displays either the buy button or the use button. 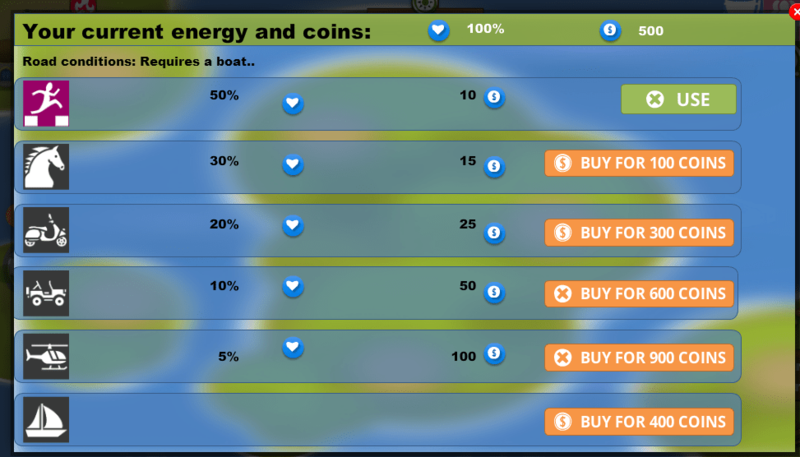 Then, it compares the cost of using each to your current energy and coins. If you can’t afford to use the vehicle it has an X on the Use button and it won’t let you choose that option. Now, to flag whether you have a transportation device or not, you could use a True/False variable. In this example, I used a number and set it to 100 when you have a device and 0 if not. The reason for that is if in the future we want to expand this feature, we could introduce “wear and tear”. That means every time you use a device it gets in a worse shape. You’ll need to repair it at some point (decreasing the number from 100 as health). What this feature could be used for is reinforcing some learning by providing a challenge as a means of repair. Is the text empty? Yes, don’t do anything. No? Let’s set the varible to the text to display. Done? Yes. How about the Close button? Shall we just close the layer when clicked? Or you want to open the Action Board? Let’s open the Action Board because the player needs to run the Bust Myth button. Set. Finally, let’s set the trigger variable, so Storyline should notice the feedback. Done. Remember the objectives? Bust all Myths and restore the Equilibrium. What’s the Equilibrium? Once you busted a Myth at a location, you may teleport through the Action Board to the Equilibrium. Imagine soldiers wandering around lost after a long fought battle. Now they can return home where they belong. But where’s home? In the Equilibrium, you see soldiers represented by the green icons. Each of them has a strength, something that they’re good at. For example, “Choose”. Your task is to figure out which of the houses (Kingdoms) this soldier belongs to based on its strength. These action verbs come from Amy Jo Kim’s action matrix, and they help plan your gamification feature set. Equilibrium means balance. You want to make sure all four types of players are represented. 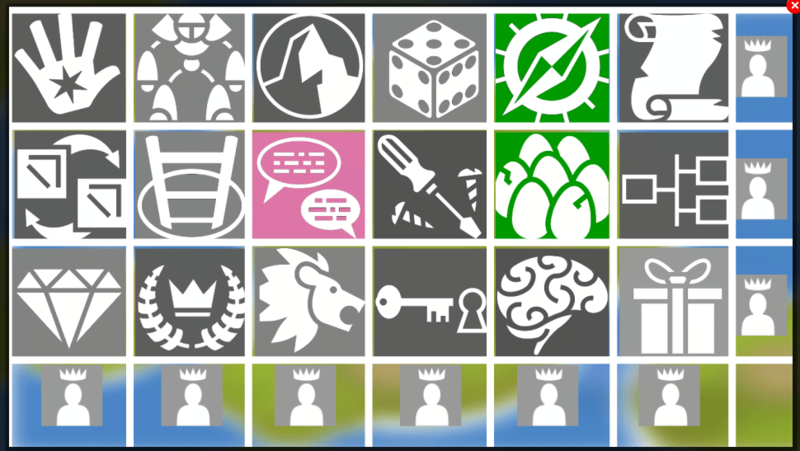 To refresh your memory, you can click on any of the house icons and learn more about each Kingdom. This time, you get a little more in-depth information of each. This information helps you match the action verbs with the Kingdom. Now, teleporting costs you 100 coins each time and you’re limited to move only 5 soldiers at a time. Each moves counts! But it has a HUGE benefit. Once you restore the Equilibrium of a Kingdom more than 50% (that means you drag and drop more than half of its soldiers), the Kingdom starts paying taxes, which you can collect. That means more money. That’s good. Taxing also exposes a game-design feature: time. Taxing happens over time. You have to wait until the full amount is collected. This is real-time. It is different from the timeline in Storyline. Game-time starts when you land in Leaderboard’s Landing and it keeps ticking even if you’re doing nothing. Time to time, inclement weather arrives in the Four Kingdoms. Visually, it is represented by darker Sea and the warning storm icon. What this means is that travelling under inclement weather costs you more. You probably want to stay where you are and bust Myth (which covertly is the ultimate goal) until the storm is gone. Find it! An Easter egg is a hidden feature that is undocumented and fun to stumble upon. There is an Easter egg hidden in this one. Of course, I won’t tell you how to get there… If you do find it, I give the right to brag on Twitter, just include #AllMythsMustDie and @rabbitoreg. Explorers love Easter eggs. Sometimes more than winning. As I said, this is a Tweak Out Loud work I’m sharing every week. Come back next week and see how it’s coming along. Right now, there’s no end yet. The Mystery element, the Matrix is not implemented yet. Also, the SCORM reporting needs to be added when you complete the mission. It’s going to be manual because we’re overriding the Storyline quiz bank feature.